The Hawaii Department of Education has been awarded nearly $748,000 in federal funds to help public and private schools prevent and respond to emergencies. The Readiness and Emergency Management for Schools grant is among $24 million given to 92 school districts in 34 states, U.S. Secretary of Education Margaret Spellings announced last week. The first-ever Hawaii grant will benefit 417 public and private schools, said Mark Behrens, safety specialist with the state Education Department. The money is scheduled to be spent this year and next to improve all aspects of emergency planning, including prevention, preparedness, response and recovery, in all schools by training staff, creating teams and developing partnerships with police, civil defense and fire and health departments, Behrens said. The plans will address scenarios such as hurricanes, earthquakes and even school shootings like the one at Virginia Tech University last year. Tsunami plans also will likely be upgraded, Behrens said, noting that 14 public schools are in tsunami evacuation zones. Waikiki's Kuhio Beach has received the 2008 Best Restored Beach Award from the American Shore and Beach Preservation Association. The award was created in 2001 to emphasize the value of America's restored beaches, said Harry Simmons, association president. "As Americans flock to our coastline during the upcoming beach season, most don't even realize they may be enjoying a restored beach," Simmons said. Dolan Eversole, University of Hawaii Sea Grant College Program coastal geologist, led the $475,000 effort to restore the world-renowned, eroded beach. Beginning in December 2006, the project dredged 10,000 cubic yards of sand from 2,000 feet offshore to three sites on the beach, enlarging it by as much as 40 feet. 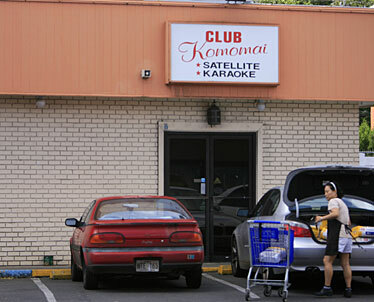 This is the Komomai Lounge in Kaneohe, where a fatal stabbing occurred early yesterday morning. The victim was stabbed in an altercation at approximately 12:30 a.m. and was pronounced dead at Castle Medical Center. 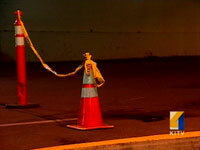 A 35-year old man is dead after a fight escalated outside Club Komomai in Kaneohe. Police say an argument started inside Club Komomai, a bar just off Kamehameha Highway near the Kaneohe Fire Station, at about 12:30 a.m. yesterday. The fight then continued outside in the parking lot when one man allegedly stabbed another man in the chest once with a pocketknife, according to police. The man with the chest wound was taken in critical condition to Castle Medical Center, where he was pronounced dead at 12:51 a.m., said Honolulu Emergency Services Department spokesman Bryan Cheplic. Police said the victim was 35 years old; Cheplic had his age as 29. The suspect, 19, fled in an unknown direction. However, witnesses provided police with the license plate of the vehicle he drove. A 29-year-old Hilo man died yesterday after jumping off a cliff and landing on an outcrop of rocks about 80 feet below. Police identified the man as Jensen Adam Stein of Hilo. Witnesses told police Stein jumped off a ledge at Pee Pee Falls and landed on the rocks at about 11:25 a.m., a Big Island news release said. A Hawaii County fire helicopter lifted Stein off the rocks and took him to Hilo Medical Center, where he was pronounced dead at 1:36 p.m. Police do not suspect foul play. Stein is the second man to die at the falls, also known as Boiling Pots, within two weeks. Last month a 27-year-old man jumped or fell off a waterfall and died. An autopsy found the Puna man had drowned. The Coast Guard was responding yesterday to a fishing vessel that was damaged by an on-board fire and taking on water about 140 miles north of Maui, a Coast Guard spokesman said. A National Oceanic and Atmospheric Administration observer aboard the vessel called the Coast Guard to report the fire at about 1:30 p.m., said Coast Guard Petty Officer Michael De Nyse. None of the six people aboard the Lady Chul, a 54-foot wooden-hulled vessel, was injured, he said. Crew members extinguished the fire, but one of the vessel's water pumps stopped working and the vessel started taking on water, De Nyse said. A C-130 aircraft from Barbers Point Air Station delivered a gas-powered water pump and a VHF radio to the vessel. The Coast Guard cutter Ahi was called back when the boat restored its electrical power last night. Police arrested a 37-year-old man after he allegedly punched another man after getting off a bus. The suspect argued with a 39-year-old man Friday while on the bus, and at about 6:35 p.m. the victim got off the bus on Kona Street and attempted to walk away when the suspect followed him and allegedly punched him, knocking him to the ground unconscious. Police identified the suspect through witnesses and arrested him on suspicion of second-degree assault. The victim was transported to the Queen's Medical Center for treatment. Police are searching for a man who punched another man and threatened to blow him up with a purported bomb on Saturday afternoon. At about 2:30 p.m. the 64-year-old victim gave the robber, who approached him for a ride, a lift to an area near Alapai Street, police said. Before leaving, the robber demanded the victim's money. When he refused, the robber pulled out an explosive device and threatened to blow them up, police said. Then he punched the victim several times in the face and fled with his money, leaving the explosive device behind, police said. The victim drove himself to Castle Medical Center where he reported the attack. He was treated for swelling in his face and released. Police have opened a first-degree robbery case. After looking at the device, police determined that it was several sparklers tied together. Big Island firefighters extinguished a fire yesterday morning that destroyed a home and started to spread to the surrounding brush in Pahoa. Firefighters responded at 9:10 a.m. to a fire at a one-bedroom house at 12-0547 Kauai St. in Kalapana and had the blaze out about 10 minutes later. They found the home engulfed in flames, which had started to spread. No one was home at the time, and the cause of the fire is under investigation. The blaze caused $19,829 in damage, according to the Fire Department.